According to Local Leaders and Business Executives, The Economic Outlook for The Woodlands Area is Very, Very Good! 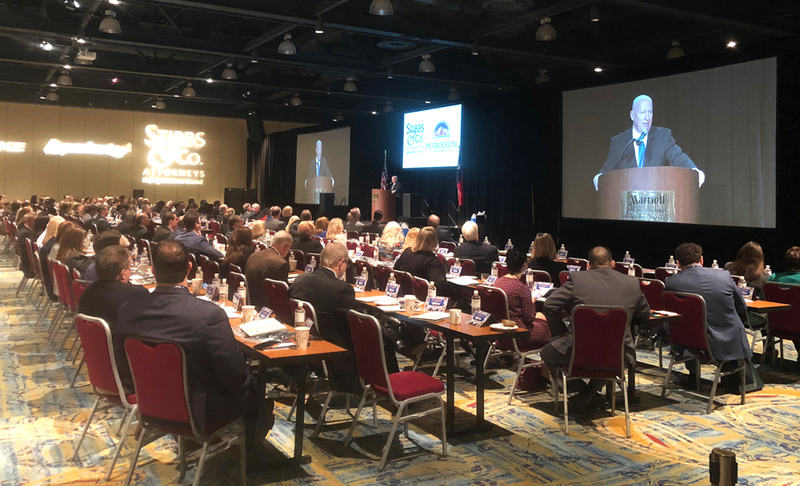 The first segment of the conference featured a community update from The Woodlands Township Chairman and Founder and CEO of The Woodlands Financial Group, Gordy Bunch. The Chairman highlighted the impact that Harvey had on The Woodlands area, and how different groups worked together to provide relief. According to Bunch’s presentation, we saw 33 inches of rainfall, over 4000 homes were damaged or destroyed, and 1,100 individuals were sheltered during the peak of the storm. Bunch also said that in terms of taking steps to mitigate disaster flooding in the future, The Woodlands created the Township Storm Drainage Task Force in 2016, and he and other local elected officials are working to coordinate with multiple agencies to seek federal funding for a reservoir study and project. “There’s no single agency that actually controls flooding issues throughout The Woodlands. Spring Creek watershed cannot be solved by just the MUDs or the Township, it is actually under the domain of the US Army Corps of Engineers. What we can do is help coordinate those efforts. We believe there’s two approaches to dealing with the local flooding,” he explained. “We took this request directly to Congress. We held a meeting in DC on January 17th, myself, Director Rieser, Judge Doyal, and Commissioner Noack, representing the elected officials of the county. We met with the appropriations committee… Senators Cruz’ and Corynyn’s offices…and HUD and FEMA directly to talk about our local needs. That led to follow up meeting here that we had February 5th discussing how we get those dollars directly were we need them the most,” he said. “There’s a regional approach, but we also need to have a local approach. There is separate funding available through the USDA to work with our MUD districts to do drainage mitigation on the local creeks and watershed tributaries. We have many MUD districts that we are working with through our storm drainage task force to help consolidate and coordinate those efforts so that we have a positive outcome,” he explained. Bunch said that the Township is currently considering the construction of a science museum and a performing arts center in The Woodlands. Laura Lea Palmer, Vice President of Business Retention and Expansion for The Woodlands Area Economic Development Partnership, discussed past and potential future economic growth in the region. She highlighted that we are currently in a job boom and our local business economy is getting stronger, indicated not only by the large and increasing size of companies in our area, but the increasing diversity of industries here as well. “The two things I want to point out are the size and diversity of these companies. To have companies this size is really the envy of a whole lot of other communities of similiar size. The other is diversity; you’ll notice that we’re not just energy anymore. You can see education, energy, healthcare, professional services, chemical, banking, hospitality, entertainment, and that’s just in the top 20 [sized companies],” she said. Within the 75 largest non-retail companies in The Woodlands area, “we’ve gained 3,211 jobs this year…Are we in a job boom? We haven’t seen growth like this since 2013-2014 (3286 jobs)." In 2013, there were 55 companies with over 25,000 jobs: energy made up 32% of jobs, professional services was 18%, education was 18%, and healthcare was 17%. In 2018, energy is 25%, healthcare is 24%, professional services is 17%, education is 15%. We’re becoming a more diverse community. “Energy, which makes up the largest sector, is 9243 jobs. When you look at where those jobs are being added, it’s companies that have ties to exploration and production. Healthcare Is our fastest growing industry in this community. From 2013-2018, the amount of healthcare related jobs have more than doubled, growing from 17%-24%,” she explained. “Are we in a job boom, are we busy, are we creating jobs? The answer is yes, absolutely! Even more importantly for this job boom is creating the diversity in this community that will make us a more resilient community in the future and certainly a more innovative one,” she exclaimed. Next, Alex Sutton III, P.E. and Co-President of The Woodlands Development Company, and Tim Welbes, Co-President of The Woodlands Development Company, gave an update of recent and future developments in The Woodlands area. Multifamily living unites include the Millennium Waterway, Millennium Six Pines, Creekside Park the Residences, One Lakes Edge and One Lakes Edge Phase two. 292 units at Creekside Park the Residences will feature townhomes with attached garages, four-story garden-style apartments, home automation in every unit, and a children’s play area and dog park. Four Hughes Landing will be a 13-floor building with 350,000 sq ft of Class A Office space, and at 10 Waterway Ave., a 20-story building with 500,000 sq ft of class A office space will be built. Lake Woodlands Crossing, a brand new 62,565 sq ft retail center on the northeast side of Lake Woodlands Dr. and Grogan’s Mill Rd., is currently underway. The construction of a 60,000 sq ft Research Forest Crossing retail center that would be located on the northeast side of Research Forest Dr. and Grogan’s Mill Rd. is being considered. 1400 self-storage units on SH 242 and FM 2978 were recently built. New offices bring more businesses to The Woodlands and drive business to local service and retail industries, which in turn increases Township revenues and allows the Township to lower its property taxes on residents, while affording the Township with enough money to provide its many services. The exceptionally low Township tax rate and the many services the Township provides are part of what makes economic development in The Woodlands so beneficial. What makes The Woodlands unique among communties experiencing exceptional economic growth and its benefits, is that it has maintained ~28% of its land as greenspace, which is 5% higher than The Woodland's founder George P. Mitchell's original vision intended. According to Sutton and Welbes' presentation, of 28,032 acres that make up The Woodlands, 4,200 are open space, 1,690 are golf courses, and 1,900 are forest preserve, ammounting to a total of 7,790 acres of green space. “The headline on this event was the economic outlook. The answer to the question? It’s very, very good, and it’s even better thanks to Kevin Brady and the new tax rates,” said Tim Welbes. Speaking next, Representative Kevin Brady (R-TX 8th district), Chairman of the United States House Ways and Means Committee, explained the needs for and benefits of the Tax Cuts and Jobs Act that he authored and worked with lawmakers in Washington, D.C. and President Trump to pass. He explained that since the passage of the new tax code, positive economic effects are already occurring in the form of bonuses, higher pay checks, new investments and jobs, and higher growth forecasts in America and around the world. He also said Texas alone is expected to gain 81,000 jobs as a result of the new legislation. Not only does the tax reform lower taxes for middle class families, but by lowering the corporate tax rate, giving small businesses 20% deductions, and allowing companies to write off investments immediately, the economic outlook for American business is looking good, he explained. He also said that the biggest benefit of the Tax Cuts and Jobs Act will be the long term economic growth and development that will come from businesses deciding to invest in the US instead of overseas, thanks to the new and now competitive 21% corporate tax rate. “There’s only one fundamental question today: Who gets to decide? When Americans work hard for their money, who gets to decide what they do with it? Is it you, or is it some government worker in Washington? Does it go to you who earned it, exhausted at the end of a long day, or is it grabbed by the federal government who doesn’t even know your name, except on April 15th?” he asked the crowd. “Our communities watched their companies, jobs, and futures leave to go overseas for too long. Our local businesses have been fighting competitors from other countries with one hand tied behind their back from an old outdated tax code. They deserved a new code that allows them to compete and win anywhere in the world, especially here at home. When they compete to win, who decides where that money goes? [Before], Washington said to spend it overseas. Our new tax code says bring it home, spend It here in America to grow our jobs, our paychecks, and our communities,” he said. A Regional update was provided by Dr. Latha Ramchand, Dean and Professor of Finance at The University of Houston, William McKeon, CEO and President of The Texas Medical Center, and John B. Jung, Senior Managing Director of BB&T Capital Markets. A CEO Panel comprised of Peter R. Huntsman, Chairman and CEO of Huntsman Corporation, Patrick K. Mullen, President and CEO of Chicago Bridge and Iron, Cathleen Nash, President and CEO of Woodforest National Bank, and Ron Mittelstaedt, Chairman and CEO of Waste Connections Inc., was moderated by Gil P. Staley, CEO of The Woodlands Area Economic Development Partnership. Jim McIngvale, well known to most as “Mattress Mack,” philanthropist and owner of Gallery Furniture, was the keynote speaker, and gave an inspiring speech about Hurricane Harvey and the resiliency and togetherness he saw from victims and heroes throughout and after the storm, at times drawing gasps, tears, laughs, and applause from those in attendance. During and after the storm, McIngvale not only opened the doors of his furniture stores to anyone who was displaced by the hurricane, but also deployed his trucks to rescue people who were stranded by flood waters. “It was the worst of times,” he said. “But it was also best of times, because for one brief moment in time, all of us came together…We cared about people, and isn’t that the way it’s supposed to be all the time?"